Figure 1. Photo (rotated by 90 degrees CCW for conserving space) of a vertical cliff face showing splay joints associated with a series of joints sheared in a normal sense in sandstone. The offset across each segment is on the order of a few millimeters. Figure 2. 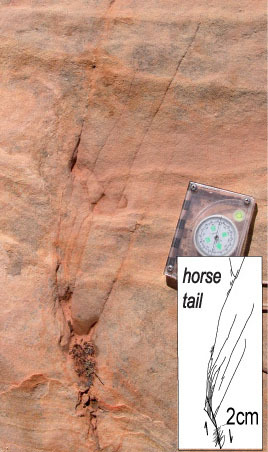 Splay joints with a horse tail geometry are associated with a series of short right-lateral strike-slip faults (map view) in sandstone, Valley of Fire State Park, Nevada. The slip across the sheared fractures is about 2 centimeters. From de Joussineau and Aydin (2007). Figure 3. 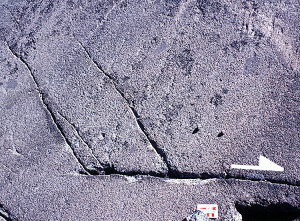 Splay joints, opening fractures inclined at the sheared fracture at high-angle on a glaciated nearly horizontal surface in granodiorite, Donner Pass, Sierra Nevada. White half-arrow head on upper block shows sense of shearing and scale bar on the lower block is 10 cm long. See Aydin et al. (2002) for additional photographs and maps from the same area. Splay joints may have a significant impact on the fluid flow properties of rocks as indicated by hydrothermal precipitations in them. They are then called 'veins' (Figure 4). 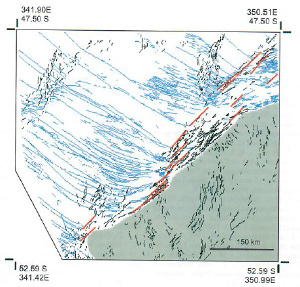 A little bit of shearing across a sheared discontinuity may produce splays that reach adjacent fractures, thus significantly enhancing the connectivity of sub-parallel fractures. In mature fault zones, the associated damage zones are intensively broken up by splay joints and sheared splay joints. The density, the maximum length, and the kink or splay angle of these fractures in a damage zone will determine the fluid flow properties of the fault zones as well as their strength. For more discussion on this topic, please refer to sections Fracture Frequency in Fault Damage Zone, Scaling between Fault Length and Maximum Splay Length, and Splay (Kink) Angle. Figure 4. A splay vein associated with a sheared vein in granodiorite. Note that the splay vein narrows down away from the sheared fracture and is located slightly behind the apparent tip of the sheared fracture. From Segall and Pollard (1983). Splay fractures with exceptionally large size may also occur. Examples of these are shown in the map in Figure 5, which are interpreted to be associated with some strike-slip faults on the surface of Venus (Koenig and Aydin, 1998). There, the maximum length of the splay fractures appears to be on the order of several hundred kilometers. Figure 5. Interpreted splay fractures (blue lines) associated with strike-slip faults (red lines) on the surface of Venus using the Magellan data. The maximum length of the splays is on the range of several hundred kilometers. Black lines on the map represent ridges which are not the focus of this presentation. From Koenig and Aydin (1998). There is a sister structure closely related to a splay joint, called a joint branch structure (Figure 6). Splay joints are considered to be associated with primary shear fractures. On the other hand, a joint branch is due to the bifurcation of a primary fracture into two or more branches with similar kinematics. The latter is referred to as a dynamic fracturing. 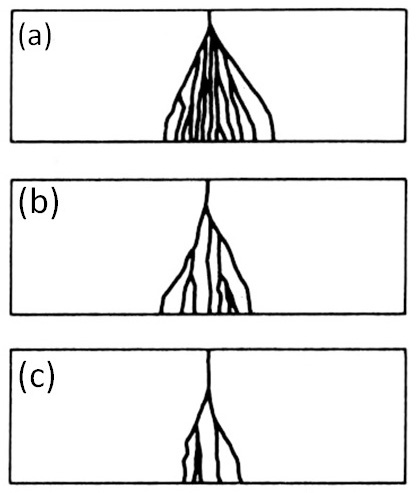 Crack branching is generally associated with high fracture propagation velocity. Figure 6. 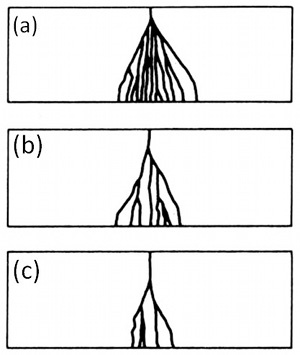 Crack branching produced experimentally from notches on the top surface of glass plates subjected to tension. From Lawn and Wilshaw (1975) (credited to J. E. Field (1971) by the authors). Aydin, A., Muller, J.R., Bergbauer, S., Eichhubl, P., Du, Y., Du Bernard, X., 2002. Fracturing and faulting of granitic rocks, Fieldtrip Guide. Stanford Digital Repository. Available at: http://purl.stanford.edu/kw115jf5825. de Joussineau, G., Aydin, A., 2007. The evolution of the damage zone with fault growth in sandstone and its multiscale characteristics. Journal of Geophysical Research 112: B12401, doi:10.1029/2006jb004711. Koneig, E., Aydin, A., 1998. Evidence for large scale strike-slip faulting in Venus. Geology 26: 551-554. Lawn, B.R., Wilshaw, T.R., 1975. Fracture of brittle solids. Cambridge University Press, Cambridge, 204p. Pollard, D.D., Fletcher, R.C., 2005. Fundamentals of Structural Geology. Cambridge University Press. Segall, P., Pollard, D.D., 1983. Nucleation and growth of strike slip faults in granite. Journal of Geophysical Research 88 (NB1): 555-568.